BSc (Hons) Real Estate Management. Association of Residential Letting Agents (ARLA). 2003/4 Dexters Kingston on Thames - Viewing Assistant. We are an independent and owner-managed estate agent with a proactive and dynamic approach to the property market. We are a friendly, listening and caring team. We specialise in Residential Sales and Lettings. We are located at Mr Rhakesh Mahadeo , 11 Brighton Road, Surrey KT6 5LX. We are members of the Association of Residential Letting Agents and The Property Ombudsman. Wefollow the compliance and training procedures of both associations. We have extensive knowledge of properties in Surbiton, Molesey, Kingston upon Thames, Richmond, Twickenham, New Malden, Esher. Thames Ditton, Long Ditton, Tolworth, Berrylands, Epsom, Cheam, Hook, chessington,Hampton Wick, Ewell, Wimbledon and surrounding areas. (Post Codes KT1, KT2, KT3, KT4, KT5, KT6, KT7, KT8, KT9. KT10, KT11, KT12, KT13, TW11, TW13, TW17, KT19 ,SW19, and SW20). This gives us the unique ability to provide a high standard of customer care service. "New estate agency: old track record. "In reality, an estate agent works with real people - during stressful and life-changing experiences. Most of our Testimonials praise our professionalism and our attitude. I like people and enjoy working with them. While gaining experience of retail, at WH Smith, I specialised in Customer Relations. While making my mark at Dexters, I was also DJ for Kingston’s Bar Eivissa. For a full view of my testimonials click here. We carry out extensive advertising in local newspapers and magazines. We print your property in colour and display it in our shop window. We list your property on popular property search website such as Zoopla well as on our own website and extensive use of social media , emailing and text messaging. Board displays for let and for sale are placed wherever permitted. We have a fully computerised property office system. Through direct link to the internet our customers, wherever they are in the UK or in other parts of the world, get up- to- date information on each property. We hold face- to- face meetings at every stage of the sales or lettingsprocess. All of our viewings are accompanied by our staff. We record comments, criticisms and compliments made by customers. We provide regular updates and feedback on viewing appointments and also on transactions relating to property. We are always ready to listen to you. We handle your affairs with complete integrity, personal commitment and care. If you have a complaint please call us or write to us. We will deal with it as soon as possible. If you're selling, buying, letting or renting - or even just thinking about it - I would like to work with you. So why not ring me on 0208 390 8500, or email sales@mahadeos.co.uk? "A genuine friendly and extremely professional approach at a very stressful time……." " Mr Mahadeo was available to deal with any questions that we had , the sale of our property was difficult at times because of our buyer but not once did we feel that we were not kept in the picture." " I was very happy with the service I received from Mahadeo & Co . Rhakesh was always efficient , personable, professional, polite, well-mannered and honest ……..I trusted him, which is certainly not something I experienced with other agents." 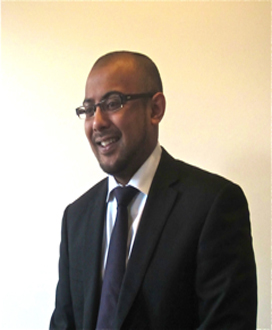 " Rhakesh is genuinely lovely person to do business with and I would recommend the agency to friends and family …….. You deserve to succeed and are a streat ahead of any other estate agents I have dealt with over the last year …."